When you have eighteen chickens and thirteen Guinea hens in your life, there are a lot of eggs to contend with. It is definitely a nice problem to have. I went on a quest recently to find eggs in the store with yolks as bright as the ones my chickens produce, and I have yet to find any. I know their diet in the Winter means a paler yolk, but my chickens manage to produce bright plump yolks even on the snowy-est of days. So I don’t accept that as an excuse for pale yolks. Maybe it is because they are happy chickens and they roam around wherever they want to go, so they consume more of what nature intended. But on the days when we don’t have time to keep an eye on them and protect them from the red fox, and coyotes, and hawks, they stay in a fenced-in area and the eggs are equally beautiful. Trick #1. 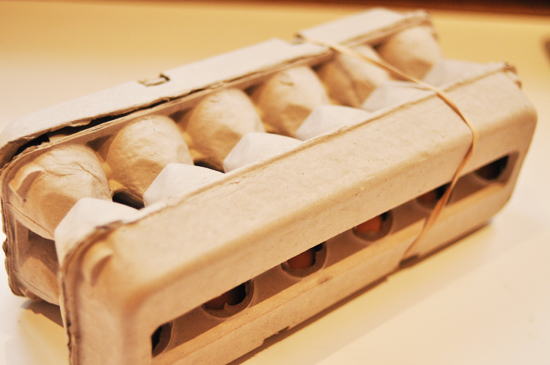 I read that if you keep eggs on their side for a day or so, it centers the yolks so that they look symmetrical when sliced open. So I gave it a whirl. I think it worked but I’m not quite convinced yet. 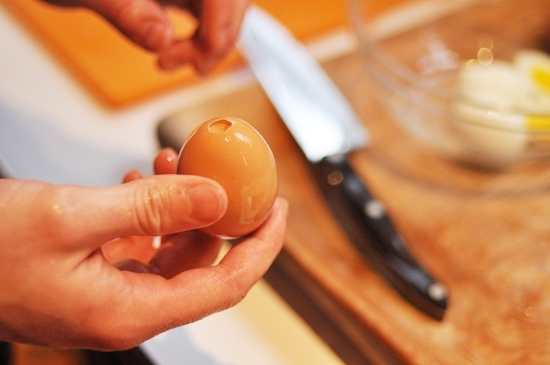 Jacques Pepin pricks a little hole in the bottom of each of his eggs to let the air out which is also supposed to help. But I wasn’t in the mood to get out the needle and hammer this time. 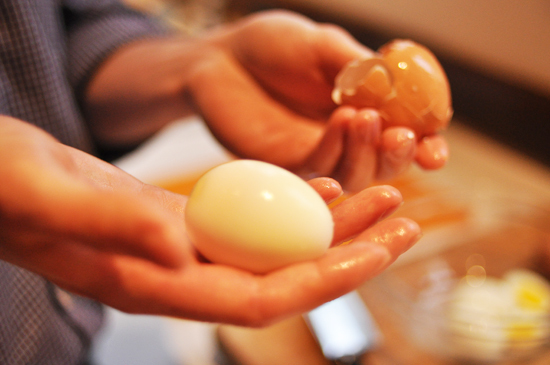 Ours are going to have to be oeufs rustique. Each chicken lays one egg per day. They are all brown except one. Can you guess who lays the white egg? (The color of their shells is simply determined by the breed of chicken. One is not better than the other). I was making these for a party so I made a lot of them. And out pops the egg! He’s useful for these kinds of tricks. Then we had a peeling race. He won. But I would never tell him that. 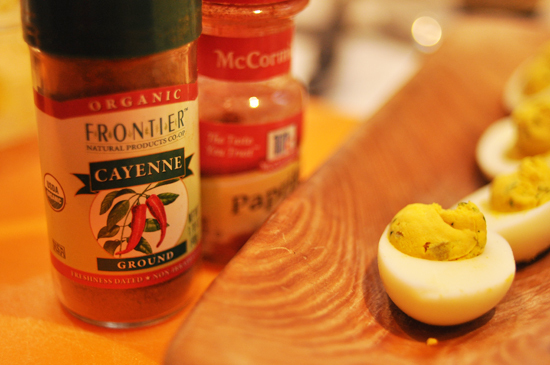 These are some of the ingredients required to make stellar deviled eggs. Cornichons are particularly crucial. Only because I said so and think they’re delicious. 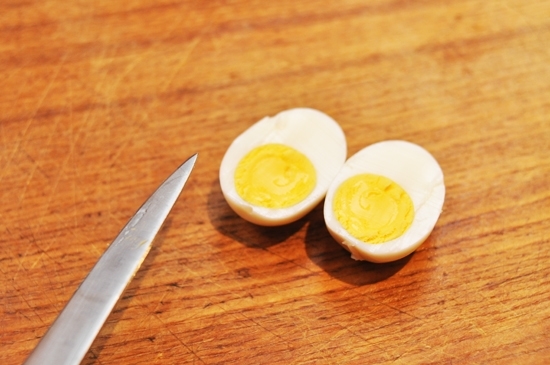 So you slice your deviled eggs in half with a sharp paring knife. See… pretty symmetrical but not perfect. That’s why I’m not quite convinced. 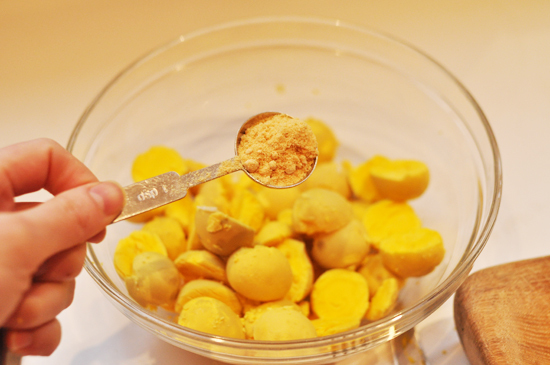 Then you pop out all of the yolks into a bowl. You aught to have these. They are disposable pastry bags and they make the world go round. If you click on the very large pink button called “My Favorite Things,” they are there waiting for you. I couldn’t find my pastry tips and it worked fine without them. 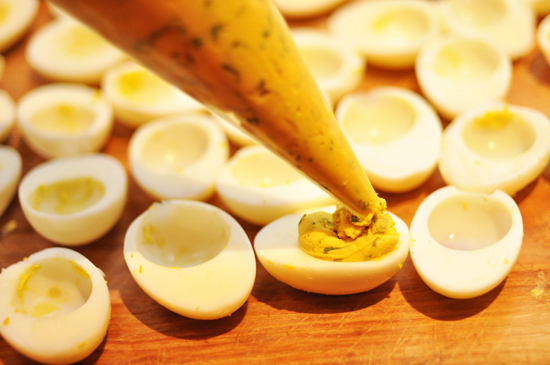 But if you’re feeling fancy, use a pastry tip for a particularly glamorous deviled egg. Next comes a little smoke, a little spice. 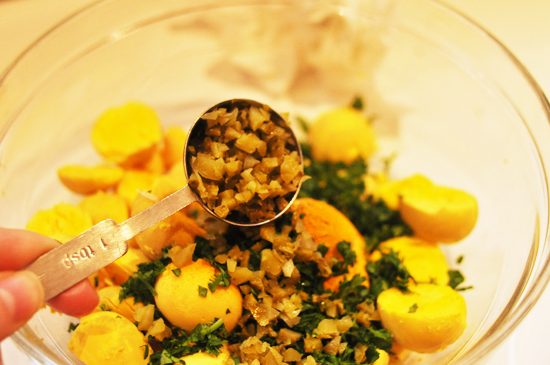 And some parsley for good measure. And good color. Green and white for Christmas! Which is what these were for. So I found a tray that was too small to fit all of them. And ate the rest. 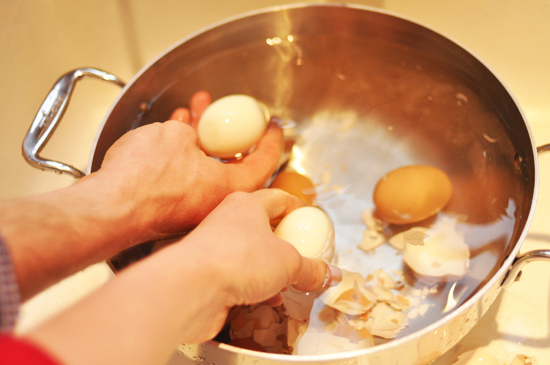 Place the eggs in a pot of cold water and bring the water to a gentle boil. 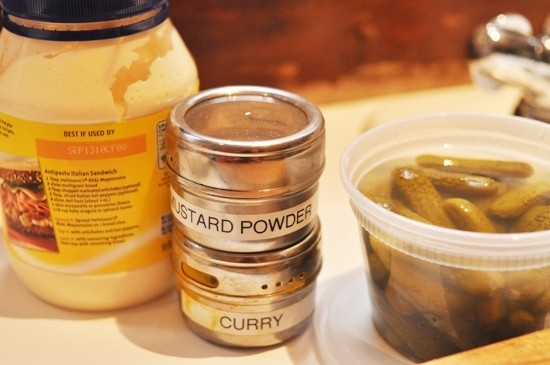 As soon as it boils, remove from the heat, cover, and let sit 10 minutes. 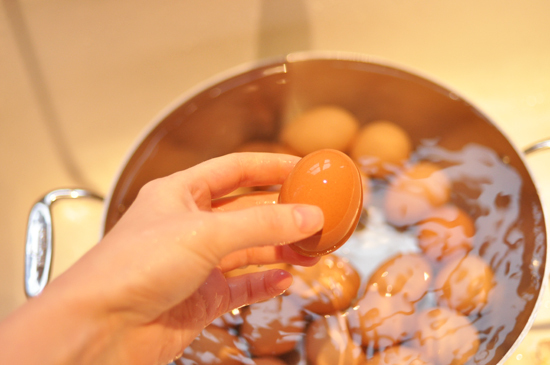 Pour out the hot water and place the pot under cold running water for several minutes until the eggs have come to room temperature. Remove the shells and white membrane. 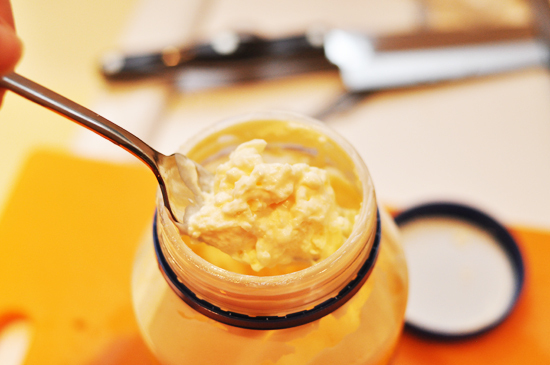 This is more difficult with fresh eggs, so you may prefer to use older eggs. 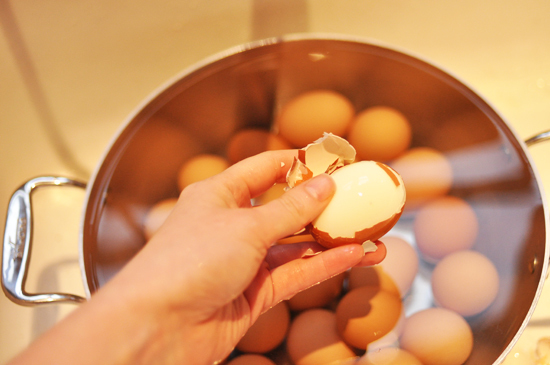 It also helps to peel the eggs under water - the shells slip off more easily without tearing the white. 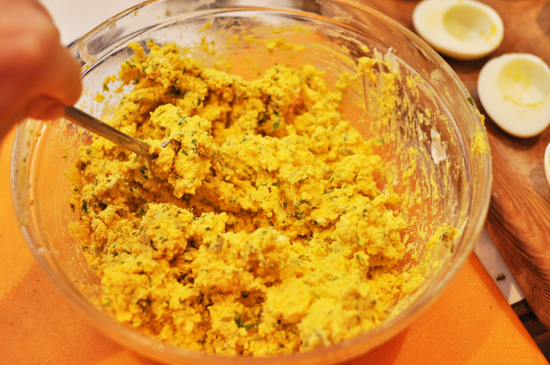 Slice the eggs in half, pop out the yolks and place in a medium mixing bowl. 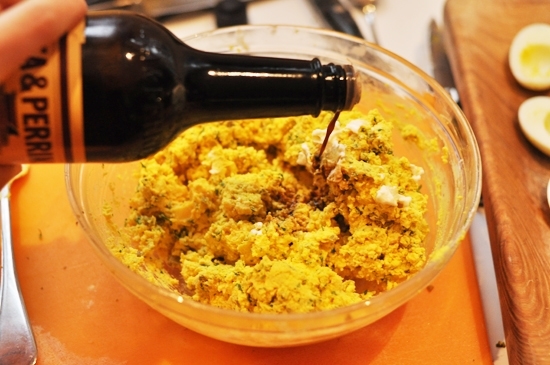 Add the curry, mustard, cornichons, mayo, parsley, and Worcestershire to the yolks and mix well. Taste and adjust the flavor to your liking. 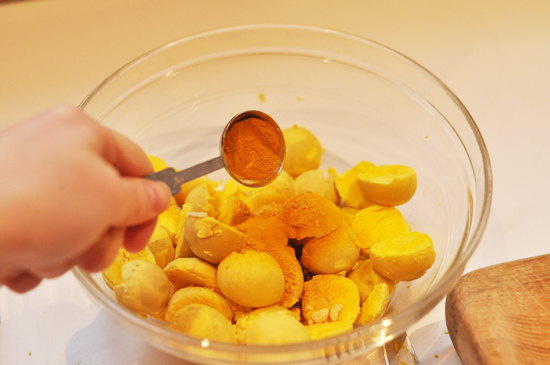 Place the contents of the bowl into a pastry bag and pipe it back into the whites. 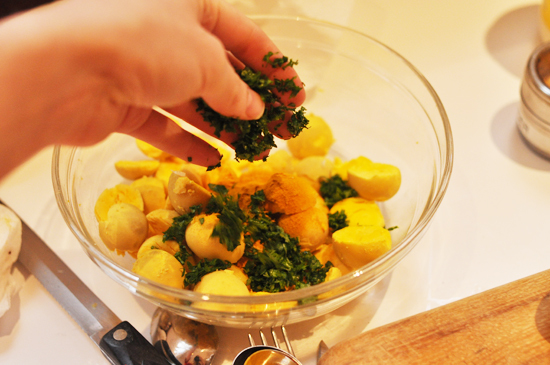 Garnish with a sprinkle of cayenne, paprika and a sprig of parsley. 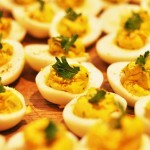 I adore deviled eggs! Bravo! Hande – Haha, yes of course! I was going to mention that but figured people wouldn't be so gross. It's more of a handy trick for when you're doing it for yourself. 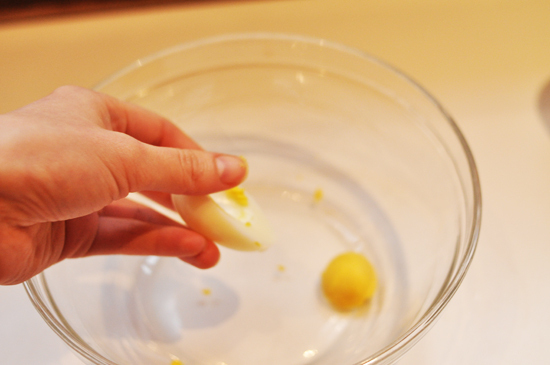 I promise I won't serve you any deviled eggs where I have used this trick Hande! I'm not a germaphobe so whatever way to peel eggs fastest works for me Georgia, thanks! I was thinking the same thing but then realized anything you fix to serve to others has your hand prints all over them. I would only do this for family just so no one could sue me. 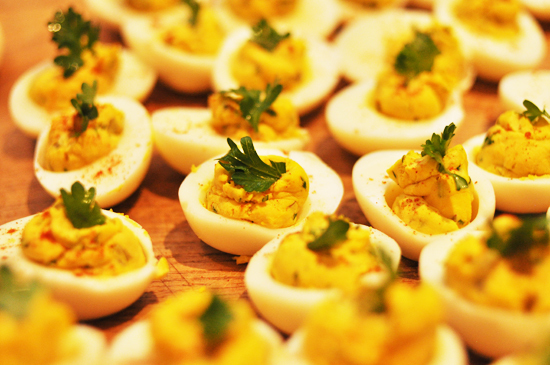 I adore deviled eggs. Especially from happy chickens. Yum! 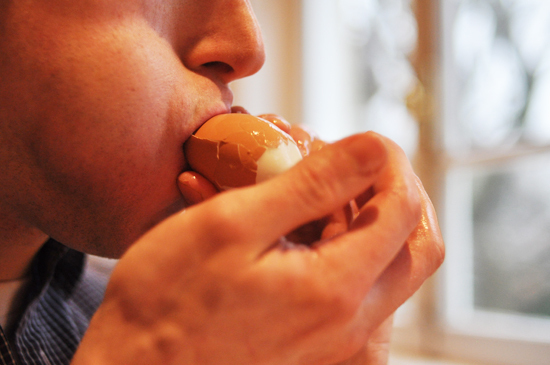 Remember, fresh eggs won't peel. They have to be at least a week old. Nice! 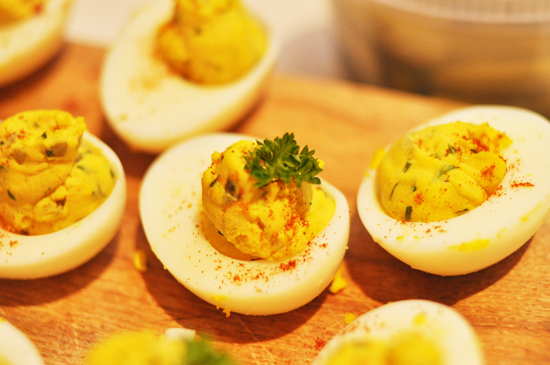 I love using curry powder in my deviled eggs too! 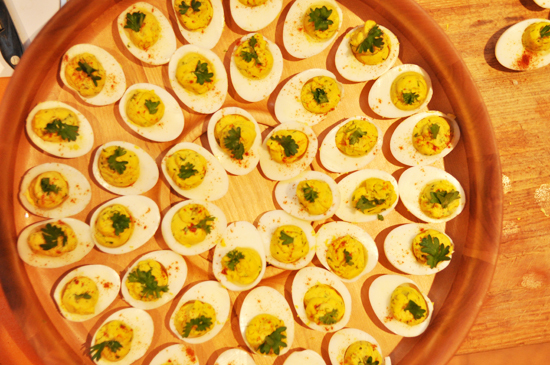 Great…now I'm going to be craving deviled eggs all week. 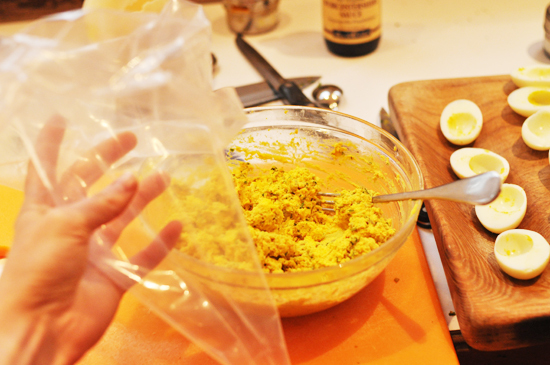 : ) I love the egg peeling trick, I can't wait to give that a try. 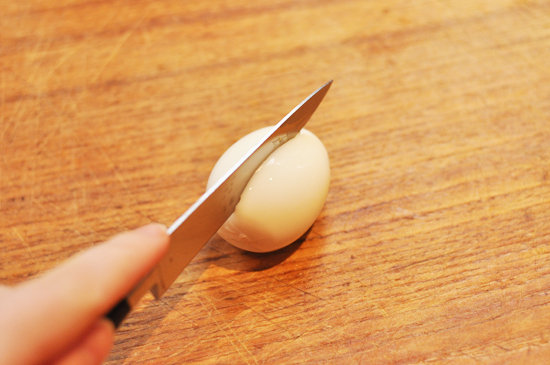 Just wanna share that here when we want to slice a hard-boiled egg in half we use thread instead of knife. Hold the egg in your palm and run the thread in the middle. It's also a lot less messy cos the yolk will not stick to the thread. Holy cow, that is so cool. Is there a demo I could see online? I want to post that on this blog : ) Thanks for saying hi Christine! 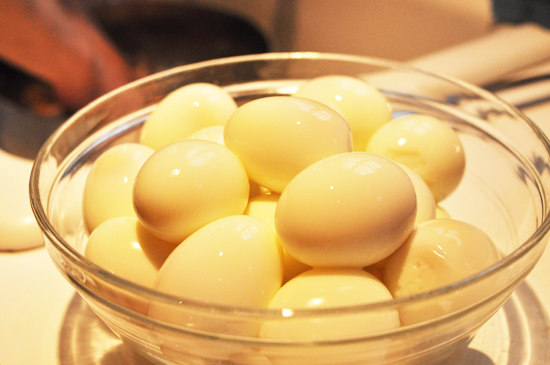 Last winter I was given 4-6 pickled eggs. 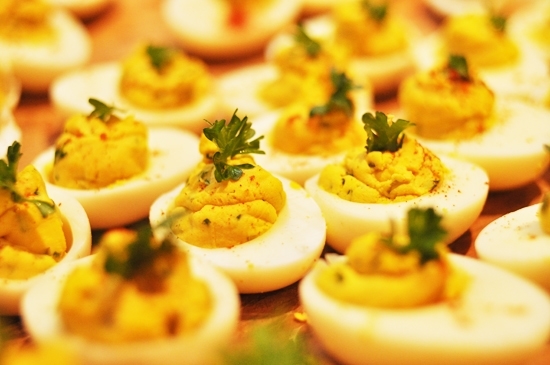 I found that they were delightful, colorful and fun when I made deviled eggs out of them. They’re naturally a bit salty so when you devil them, don’t add any salt. They would make the most beautiful deviled eggs, great idea.